All very true, and I think that we can imagine that a hungrier, leaner team would have found some interesting techniques that may have eluded the IBM team for lack of searching. This being said, your initial Wikipedia domain-limited searches do rely upon Google… which has more than a few Watsons in all its data centers churning out the answers. While it is quite possible that you could devise a series of search protocols and heuristics that would give you the correct results on a smaller machine, it’s also credit to Google to be able to crawl through wikipedia and find those pages from said keywords; still not a trivial problem at that stage. With a local tool, there are also advanced search techniques Google doesn’t offer: fuzzy document similarity; arbitrary boolean combinations; boosting particular terms as essential (such as those highlighted by ‘this’ as being central to the answer). It would surely take a lot of work and deep analysis to match Watson – the confidence intervals especially. But I think my examples show that a lot can be achieved with just Wikipedia and simple tools/heuristics. I’m pretty sure the answers to almost every Jeopardy question are stated, in one way or another, in a 30GB Wikipedia dump (which preprocessing in a manner conscious of typical Jeopardy patterns/topics would reduce to an even smaller size). So what’s occupying the other 14,970GB of Watson RAM? You should watch the PBS Nova documentary about the 4-years spent developing the software. This wasn’t some freakin’ 10-line perl script they kluged together. His point is that it could have been and would have achieved the same results. At the very least it would have been drastically more efficient in terms of computing and human resources. That really doesn’t speak well for those 4 years spent on development. No it would NOT have achieved the same results. If you think it could go ahead and write the perl script and try it out! A perl script linked to Google would have got maybe 10% of answers right producing embarassing garbage the rest of the time. Getting that % up to 90% is what takes the hardware. Differences in degree become differences in kind. Why did nature give us 100 billion neurons when mice have far less? After all, mice can do a lot of the things humans do? There’s no difference between the mouse and human brain except in scale. What a waste of resources for nature! You have used human deductive reasoning to arrive at your conclusions here. If Watson is reasoning as you say, it is smarter than I thought!!! You have considered the Spines (zoology) page, why not the “Spines (anatomy)” or “Spines (book)”? But I accept some of what you say, Watson produces non-sensical answers which a human would never do indicating that it does not truly understand the human world. Don’t underestimate Watson. I have some experience developing AI systems, and it’s always the most effort and computational resources that goes into squeezing out the last % of correctness/recognition rate. Sometimes, getting 90% right can be pretty easy. But each % from there can be exponentially more difficult. Nothing but a lame publicity stunt from an aging failing corporation whose motto “Think” is increasingly ironic. Watson has no semantic awareness, and just uses a flowchart to sift Google answers and created estimated probabilities based on cross-correlations. It didn’t even know the difference between the U.S. and Canada. What did IBM think, they would use the Jeoparetarded promo to sell the river-slurping dino to major corporations for medical diagnostics? Oops, I gave the diagnosis for a giraffe. It would be really funny if Google just duplicated its functionality and provided it free to all. Let’s just stop for one second and marvel at the human brain and the 2 billion years of evolution which gave birth to it. Agreed 100%. 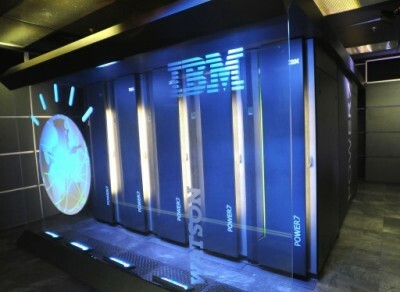 People are saying Watson is overkill but it is actually rather weak compared to the human brain. So Watson is at a considerable disadvantage. Do you have a reference for that 65 kW of power? I agree. In your examples you got rid of all the functional words that give meaning to the language and still got the correct answers. For me the show was the equivalent of a student stealing the questions a day before the exam. I had the feeling during the show that Watson was cheating and not really “thinking” just by looking for key words in encyclopedic databases. Based on the first program only, you could easily see which kind of questions were easy to Watson and which not. So the second and third program questions could have been rewritten to give Watson more of a challenge and a fair play to the human contestants. And by the way, on betting for answers, Watson was a stingy and coward player. If solving this problem is as easy as you claim, why did Google publicly congratulate IBM on this achievement? Could it be the brainiacs at Google, who know something about searches, appreciate how difficult the Jeopardy! challenge was? IBM checked out the possibility that this could’ve been done by a “basement hacker”. They found a “homebrew” approach fell well short of the goal. I didn’t say it was ‘easy’; I suggested IBM wound up using far more hardware than necessary, probably for promotional/traditional purposes. I could see the development of the system as requiring lengthy, large-cluster analysis. But when boiled down to a trained knowledge-base sufficient to answer all Jeopardy questions, 15TB of RAM seems like about 14.5TB too much. Of course Google would congratulate IBM. I congratulate IBM, too. It’s an impressive achievement, both as technology and marketing! That doesn’t turn off my ability to analyze the scope of the problem, and the institutional incentives involved. Did the IBM team even have an incentive to optimize for hardware/cost? Or was showing off a room full of expensive computers one of the goals from the beginning? The excerpt from the Baker book at Gizmodo actually feeds my confidence. It reports that at the outset of the project in 2007, a single IBM neophyte (!) with only 1 month, 1 computer, and a measly 500 training clues (!) 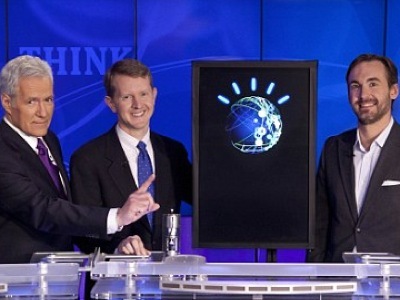 was “nearly matching” Piquant, IBM’s “state-of-the-art in Q-A technology”! Somehow Baker accepts the project leader’s spin that this was an “ideal” result for the project. How many man-years went into Piquant, and a lone fresh graduate matched it in the Jeopardy domain in a month? Rather than viewing this as a vindication of their plan to devote a giant team and hardware plant to the problem, why didn’t they let the “Basement Baseline” team have a couple more people, a handful more machines, and a few more months of time to work (if not 3.5 more years! ), and the 200,000+ clue J!Archive of past Jeopardy rounds? Why didn’t Jeopardy and IBM let other teams compete for real money, like the DARPA Grand Challenge or Netflix Prize? The end result is impressive, but also heavily orchestrated to sell Big Iron, and unvalidated by actual resource-constrained, independent, external competitive evaluation.